A friend put me unto a concept by Carolyn Leaf and her book, Switch on Your Brain. Neuroplasticity refers to changes in neural pathways and synapses due to changes in behavior, environment, neural processes, thinking, and emotions – as well as to changes resulting from bodily injury. The concept of neuroplasticity has replaced the formerly-held position that the brain is a physiologically static organ, and explores how – and in which ways – the brain changes in the course of a lifetime. More simply put, thoughts, ideas, bitterness and forgiveness represent physical changes in our brain. Neuroplasticity is the term for changes in our synapses and neural pathways. Like the rest of our body, our brain needs to be cared for and continually renewed with a healthy outlook on life. There is a very simple way to renew our mind and keep it healthy. Simply update our heart. Our hearts have very good reasons for our current beliefs and behavior. Our minds are really just the computers that invent the superficial justification for our behavior – good or bad, our minds always have good reasons. If you want to change something we need the Holy Spirit to show us the motives of our heart and find a better reason for changing our motives and thinking at a heart level. Just trying to change our mind is a diet that doesn’t usually work. Our hearts are driving the bus. Our minds are not changed apart from roots in our hearts. Aside from healing specific problems, God has given us a great way to have a healthy heart and mind that results in healthy relationships and lifestyle. Our goal is not just healing, it’s living in continual health; not just mental cleansing, but keeping it clean… far beyond just a change of mind. 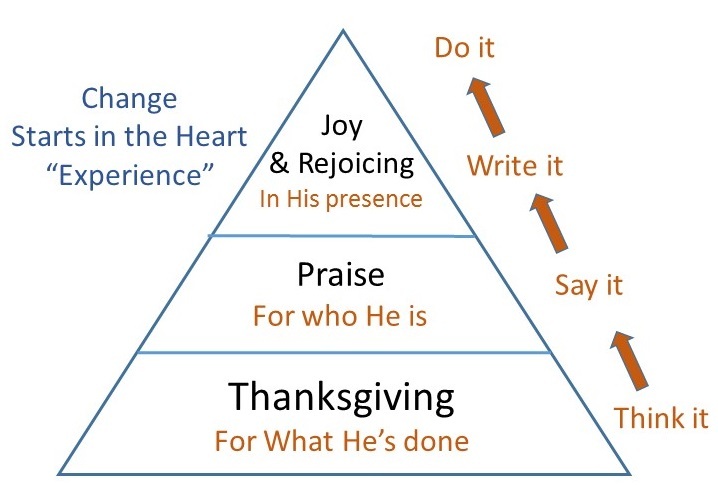 Thanksgiving – is the process of appreciating the great things God has done for us. I’m not suggesting a sacrifice of praise and thanksgiving or some artificial regimen of putting on thankfulness. Our hearts have to have real and tangible reasons to be thankful and we need to find them and offer thanksgiving from sincere hearts. The sacrificial system is over; God doesn’t need or want your bull – pardon the pun! We cannot praise or thank our way out of anything, unless it’s real. It’s not a gimmick and it can’t be offered from sacrificial obedience. Praise – is another step in the progression of a healthy heart. When we take stalk of everything we’re thankful for, it becomes obvious that God takes pretty good care of us. He is our strength, protector, provider, healer, our peace, our righteousness, our shepherd, and our ever present friend. Thankfulness for all the good things God has done naturally gravitates to praise and appreciation for who He is. God is good! Joy and Rejoicing – Searching our hearts for the real reasons to be thankful and appreciative leads somewhere… straight into his presence. The reality of the Kingdom of God is the sense of a party, a banquet of celebration, and the sound of music. Our hearts leap when we experience the presence of God and hear the sound… with tears, laughter, dancing. I can only describe the Kingdom as fun because even through suffering, trials, persecution, and failures… we can always step into, or stay in, the presence of God by our choice. Remember?… it starts with our wholehearted reasons for thanksgiving, our genuine praise for His love, His majesty, His mercy, His favor and His Kingdom. Heaven can start right now! 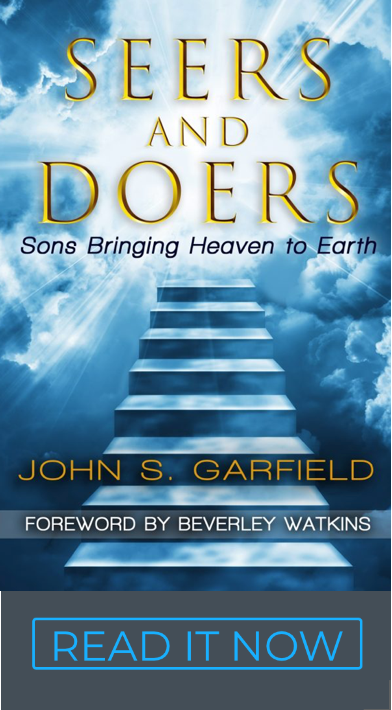 How it works – In His own genius, He chose us and wrote His desires in our hearts so that when our dreams come true, all heaven is already rejoicing with us because those same desires are even more in God’s heart. Is this strategy too good to be true? Very nearly. Many choose religion, recipes, and rules over the person of Jesus and the presence of God. He is neither predictable nor containable. Our God is blessing nations and inviting us to co-labor with him… not as servants, not through obedience and sacrifice as though we don’t enjoy Him. Knowing Jesus and reigning with him to fill the earth with His glory is a privilege so filled with joy and rejoicing that our hearts leap at every victory and endure every hardship. We are more than conquerors… changed from sinners to winners. And, if suffering or failure or rejection or persecution is part of my pathway, I’m still signing up with thanksgiving, praise and rejoicing. I’m all in. Jesus bought my ticket and I’m going to the dance, now. Rewire your heart and Mind – The news is a steady drumbeat of negative events that fills our mind and heart with ideological junk food. If our hearts and minds are obsessed with fear and conspiracy theories, we are simply missing the Kingdom. We are wisely optimistic. Make it part of your regular devotions to focus on the why you’re thankful for what God has done, the attributes worthy of praise, and the reasons we have to celebrate. Write them, say them, dance them and do them. Our assignment is to fill this earth with His glory, His presence and start the party. In reality, the Kingdom is already here. Our job is become aware of it, swim in it, and help others do the same. Our hearts have to have good reasons to do that.